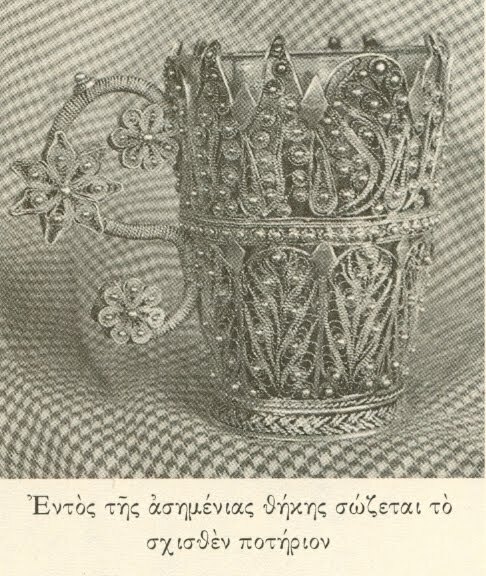 In the days of Paisios, the hieromonk of Mytilene, there occurred in the Kalyva of St. John the Theologian the miracle of the entire splitting of the wine cup, to show the fathers present that before Christ both John the Forerunner and John the Theologian have the same boldness before God. 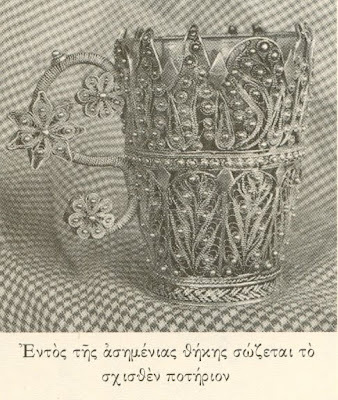 The cup has been placed in a silver casing with metalic artistic decoration. The two pieces are of the same weight. Paisios returned to Kavsokalyvia to his old Kalyva, after receiving his regular ration from the Monastery of Xenophontos throughout his life. During the feast of John the Theologian, where hospitality was given in the trapeza according to custom, and as the pilgrims gathered modestly to the glory of the Beloved Disciple, there was raised a long and curious debate among the elders: Who is the greateast, the Honorable Forerunner who baptized Jesus, or John the Theologian who leaned on His chest? Many reasons were exchanged during this pious rivalry and a solution was not reached. Suddenly a beautiful cup, full of wine in the middle of the table, broke in two pieces. This event was considered very important. Hieromonk Paisios was then inspired to weigh the two pieces, and they were the exact same weight. The Elders then rose up and praised God, Who through this sign gave the right solution to the discussion, showing that like the Holy Trinity is equal in honor, so the two saints should have the same honor, the Honorable Forerunner and the Beloved John the Theologian. Source: Ascetical Personalities and Guidance From Athos. Translated by John Sanidopoulos.